Robert Jasiek: The definition "is a move which is sente for either player" is wrong because the players might have a different first move, i.e., it need not be only one move! Besides, I dislike the variation "sente - sente" of the term because more usually this refers to a sente with a sente follow-up (while sente - gote refers to a sente with a gote follow-up). If one wants to express sente for both sides, one should write "(sente|sente)". rubilia: I think it would be nice to spend some words on how miai values of double sente are calculated - either here or at MiaiValue. The basic explanation there suggests to understand them as DeiriValue divided by the local move tally, but doesn't care about tally = 0. However, "relativly large numbers", as mentioned here at DoubleSente, is different from infinite. Charles Well, they don't officially have miai values. If they have some sort of large miai value, that means that the crude idea of double sente has become replaces by some more accurate discussion. Bill: See Double Sente is Relative for a couple of examples of calculating the value of double sente. The point of double sente, really, is that they (and the replies to them) are so large when they come up that they might as well be infinite in size. Hurry to play them. Gabaux: Could some of you guys show a position, where both players have a sente? The question arised yesterday, when I played a game with a rather newbie go player. Charles Matthews There are a couple of separate issues here. Here is an example of double sente play. It is likely to be treated as sente by White because Black next at a is very big territorially and affects White's base too. (See though How big is the 6 point double sente for fuller discussion.) But if White plays first at , Black is quite likely to treat that as sente also, to preserve the corner territory. That is, a play here is potentially sente for either side. Which play is 'more' sente? This is a different type of position. If Black plays the marked stone, should White treat it as sente, by answering at a? Assume White's alternative is to play the marked stone in the right corner. Black's threat is to play next at b, which is big in terms of territory. White's threat is to play next at c, which may call into question the safety of Black's corner. In this case White's play is likely to create a more serious threat. Black ought to treat it as sente. This is not just a question of territory. The priority given to plays may also involve questions of attack and defence. I think double sente would be more like Black playing a sente against White but White doesn't respond by defending the stone in danger, and instead plays sente against a black stone. 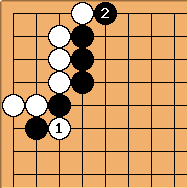 This forces Black to consider the loss of his stone against the gain of a capture. 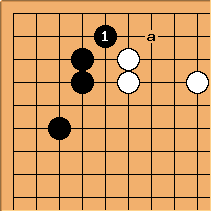 In this case Black would connect and leave the white stone for later consideration. This however has shifted the initiative from Black to White. Bill: That's not unreasonable, but, as it happens, double sente refers to a different kind of situation. What you are talking about is discussed on the in-between move and Mutual damage pages.